With an open front design, our spray to waste powder booths are perfect for small powder applicators. A cost-effective solution, a spray to waste powder booth makes efficient use of shop space and is used for large or small parts. With an open face design and 3-stage filtration air is drawn in through the open front of the spray booth and passes through the booth’s working area into the filtered exhaust plenum. The air is filtered in three times and discharged back into the room. Quality Construction Panels are constructed from 18-gauge galvanized steel, flanged and CNC punched on 6” centers for structural integrity. Panels are fastened with 5/16-inch bolts with flanged self-locking nuts and are to be sealed with the provided caulk following assembly. 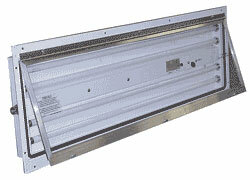 Collector Module Recirculates clean, filtered air into the booth and includes high quality filters. They are factory-assembled, powder coated white mild steel construction with removable powder drawer. Lighting ETL listed (Class 1 Division 2) and are supplied with multi voltage ballasts to accept any voltage between 120V and 277V power. Bulbs are included. Final Filter Proving Assembly Ensures filters are installed and working properly. Interlocks with the air solenoid valve. Our factory trained installation crew can get your new Spray to Waste Powder Booth installed correctly and quickly. Variable Frequency Controlled Fan (VFD) – Connected to the exhaust fan motor, this allows for the fan to turn at any speed to optimize airflow within the booth. The VFD also helps save on operating costs due to the reduced amp load on the motor, and with the soft start of the motor.